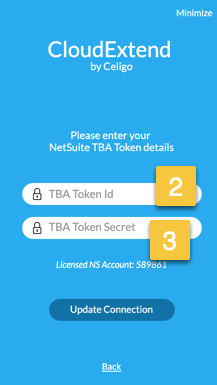 NetSuite Admins will be required to create a NetSuite Token & Secret for each licensed user unless the users have NetSuite permissions to create their own tokens. Token Based Authentication is enabled in your NetSuite account -- Setup > Company > Setup Tasks > Enable Features > SuiteCloud > Manage AuthenticationMake sure “Token Based Authentication” is checked. 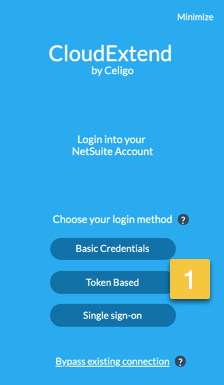 NetSuite Administrators need to ensure that the company account has Token Based Authentication enabled. If this feature is not enabled, you will not see the permissions required in the next step. 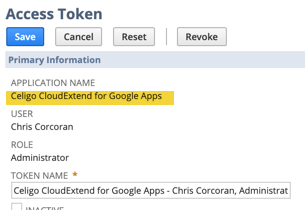 Step 2: Create Access Tokens This step may be performed by end users if they were granted the 'User Access Tokens' permissions above, otherwise a NetSuite Admin will need to create the tokens. Select the application (Celigo CloudExtend for Google Apps) the desired role, and accept the default name for the token name or supply your own then press save.